It doesn’t matter who we are, we probably all have one particular thing in common; the fact that we love to eat. Some of us may enjoy eating a nice steak and others might enjoy having a big bowl of vegetables but regardless of our taste, we rarely ever want to give up the food that we truly enjoy. In fact, there are many of us who would admit that we have been hangry in the past and scientists have even shown that it is a real thing! Apparently, cats have similar feelings to us. Cats may be finicky as far as food is concerned but when they are hungry and ready to eat, there is nothing quite like it. In fact, you probably wouldn’t want to get between a cat and their food, unless you wanted to have some type of trouble. They will often exert themselves in order to ensure that they are able to finish the bowl of food that is in front of them but what if it was taken away by an unusual circumstance? You are about to see the results. The progression of pictures that you are about to see show something that is rather amazing and quite humorous as well. 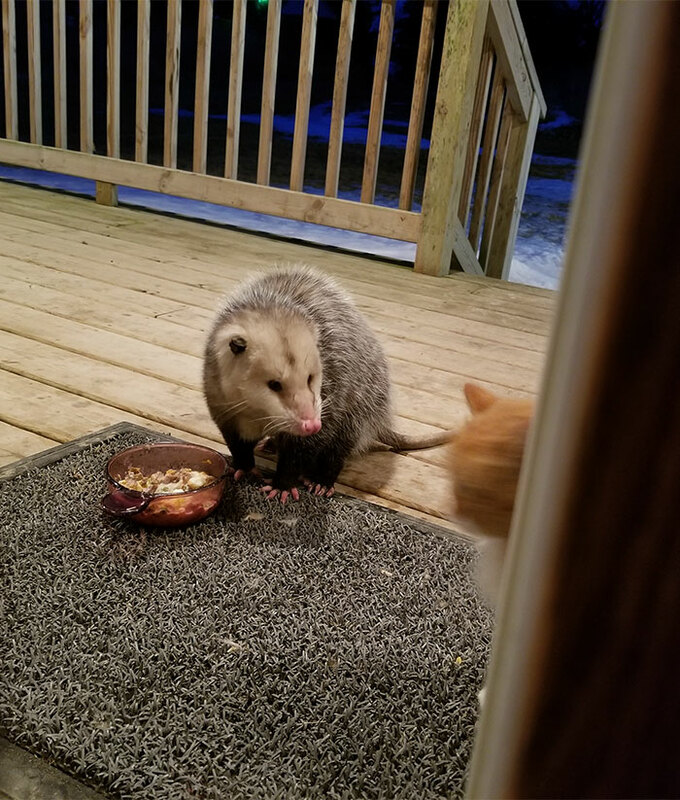 It starts out when a cat was given a bowl of food on the front porch and they were probably really excited about the opportunity to have something to eat. It wasn’t long, however, before they had an unwelcome visitor and that visitor came up and started eating the food without even being invited! 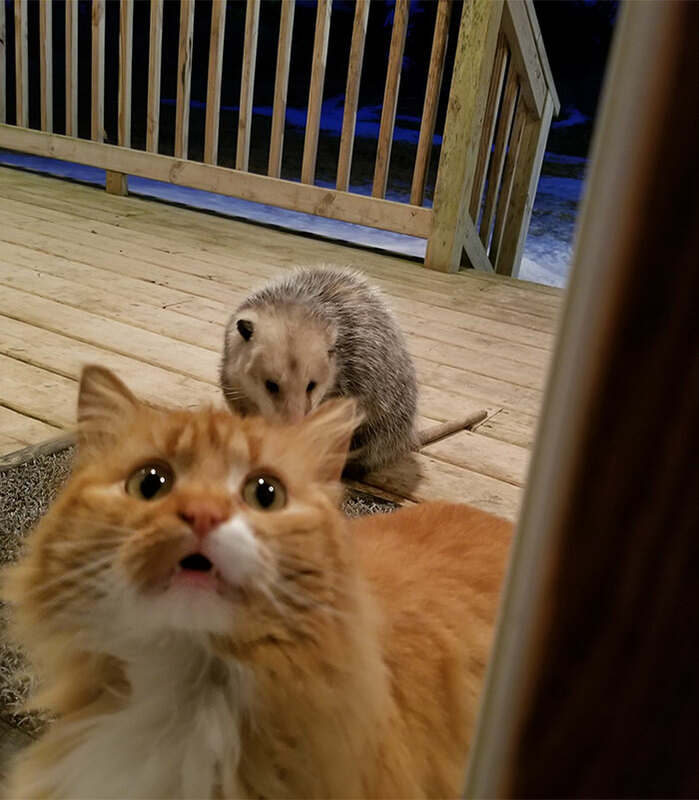 It was a Possum, and the reaction of this adorable cat, which was shared by MrRogers247 is nothing short of hilarious. At first, the cat looks over as if to say, hey, what are you doing in my food?! 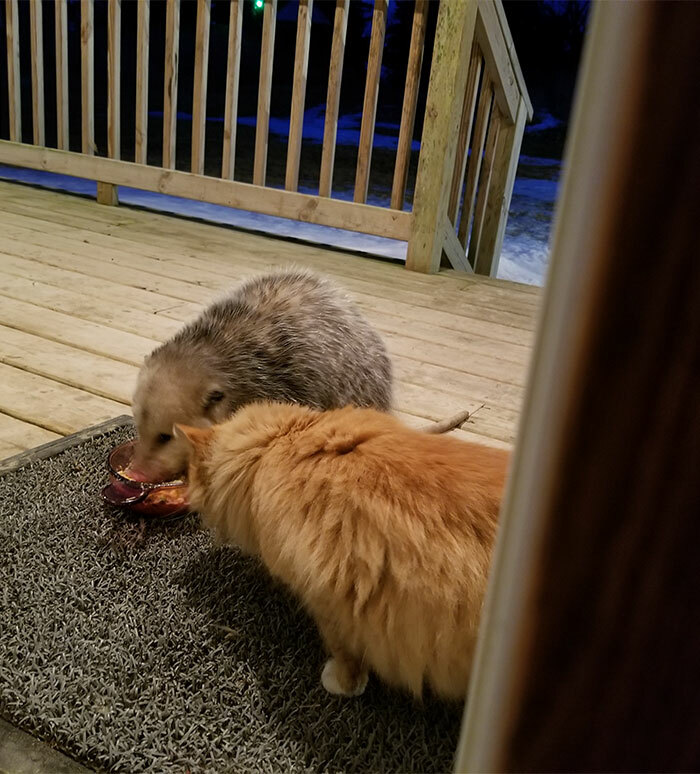 The possum just continues to eat, however, completely undisturbed over the fact that he is stealing food from the feline. That is when the cat turned around and looks at the door as if to say, something just isn’t right about this! 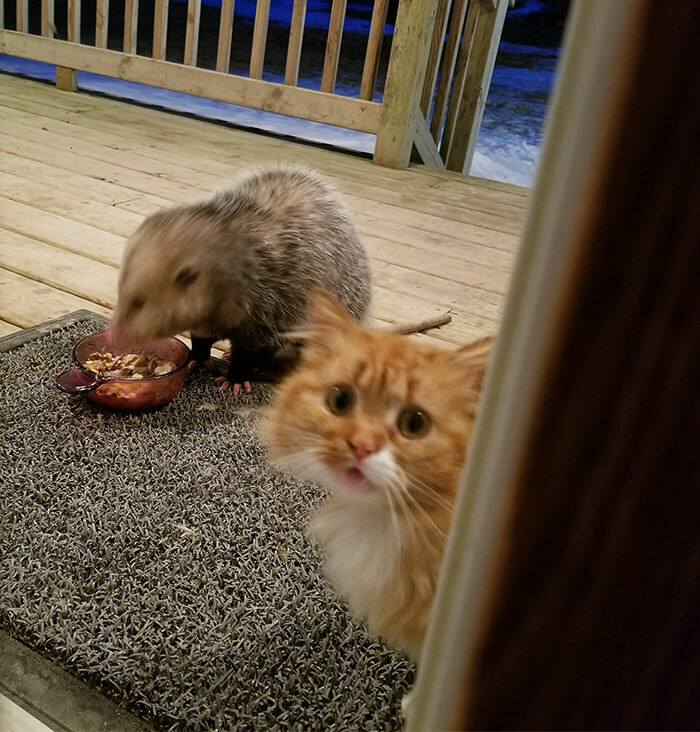 The look on the cat’s face is priceless and it is almost as if he is begging for something to be done about this Possum who is continuing to help himself to the food in the bowl. 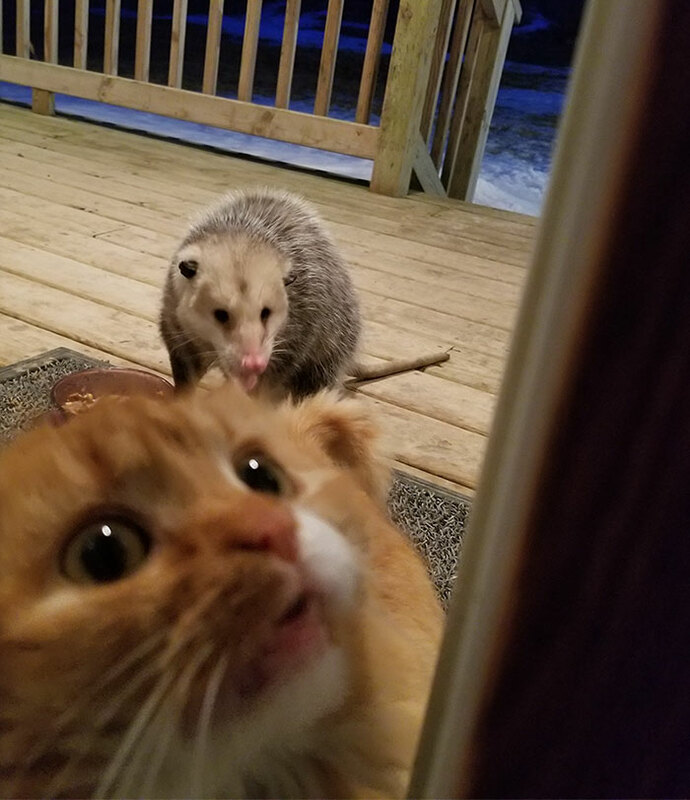 At this point, the cat decides to get a little bit up close and personal with the human, almost as if they are begging to come inside. It wasn’t long, however, before they turned around and decided to confront the unwelcome visitor to see what happened. 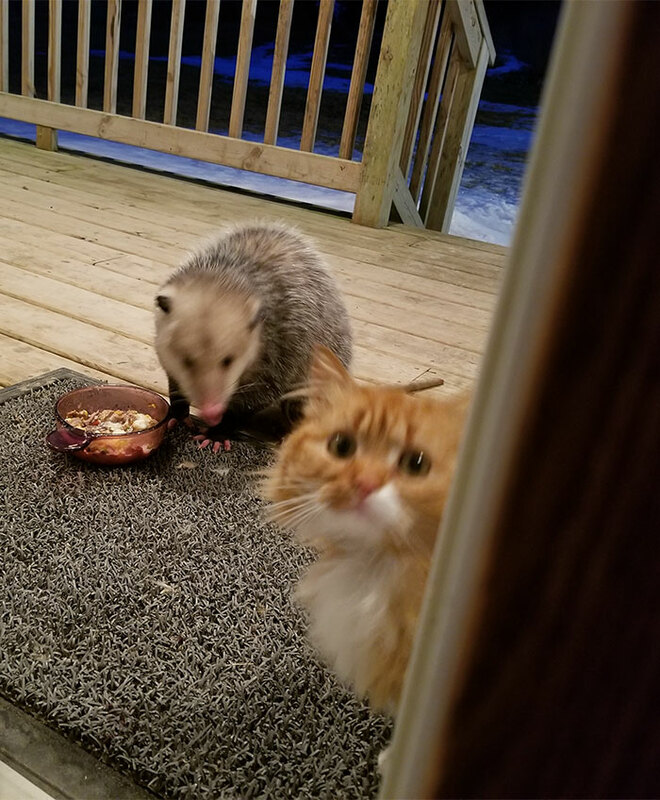 Once those beady eyes of the possum stared at the cat, however, he quickly backed off and started coming over to the human again, almost as if he was begging for help. Admittedly, some people are going to see this and be concerned over the fact that there was a wild animal in close proximity to the cat. 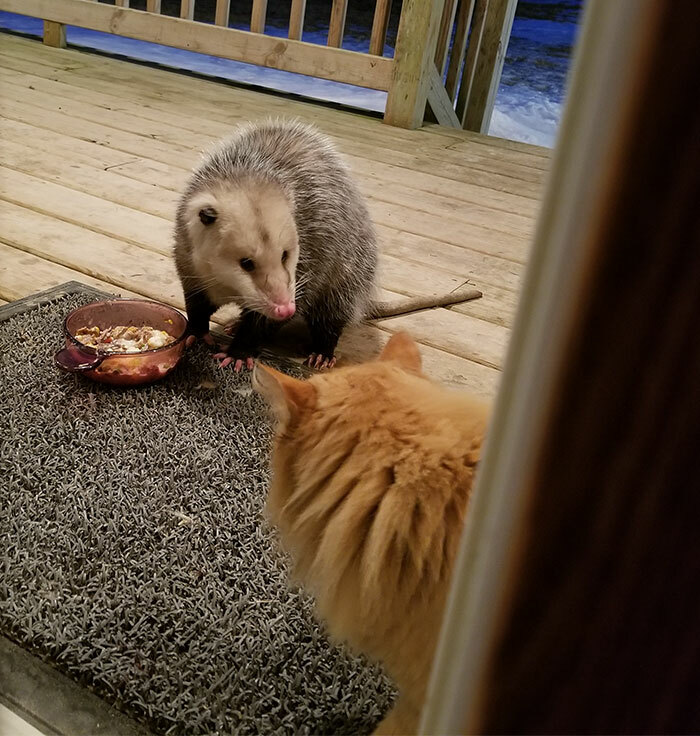 To be honest, the possum looks fairly tame to me and although they don’t typically make family pets, this one looks almost as if he is in the running. You may also be concerned over the possibility that possum is carrying rabies but that is extremely rare. In fact, it is probably just as likely for the cat to get rabies from a stray cat than to get rabies from the possum. That being said, possums can be rather territorial when they are cornered or if they feel threatened. To be honest, I doubt very seriously if this Possum feels threatened at all. In fact, he may just seem to be a little bit annoyed over the fact that he is having his free meal interrupted by this cat. He stopped to look up on occasion, but quickly goes back to his food again. There are a few things that could’ve been done in order to correct this problem and perhaps to avoid a bigger issue. For one thing, the food could’ve been put inside so that the cat could eat in peace and without the possibility of a wild animal coming along and stealing his food. Secondly, the cat could’ve been fed during a time of day when the possum was less likely to be around. In any case, all’s well that ends well and it seems as if the possum got his full and the cat may have ended up with nothing. What we ended up with is a series of pictures that is going to make you smile from ear to ear.